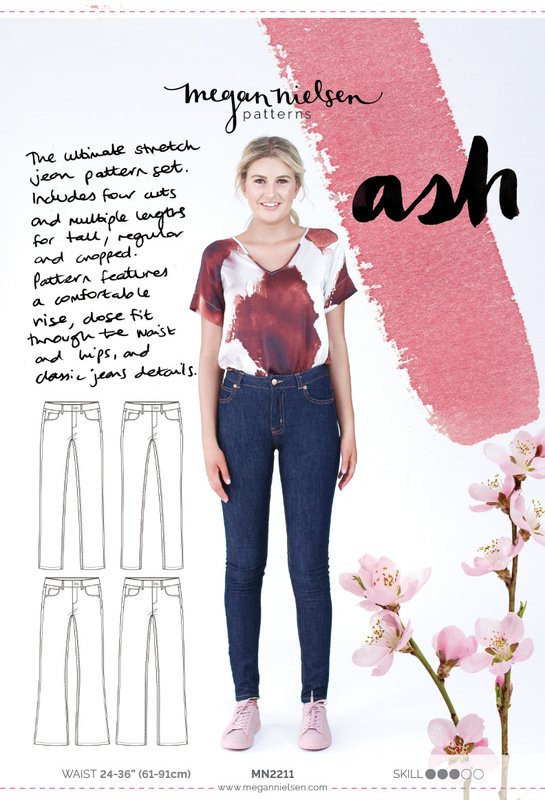 If you’re like me, then when you compare your body measurements to the Ash jeans size chart, you might find that your waist and hip measurements fall in two separate sizes. According to my body measurements my waist is a size 28 and my hip is a size 30. If i cut a straight size 28 I would have a hilarious time trying to squeeze my thighs into my jeans, and vice versa if I cut a straight size 30 i’d be stuck with pants that slid down and fell off all day. Nobody wants that. So what should you do? Today I’m going to show you how to choose the correct size jeans and blend or grade between sizes for an awesome fit. Lets do this! First things first. 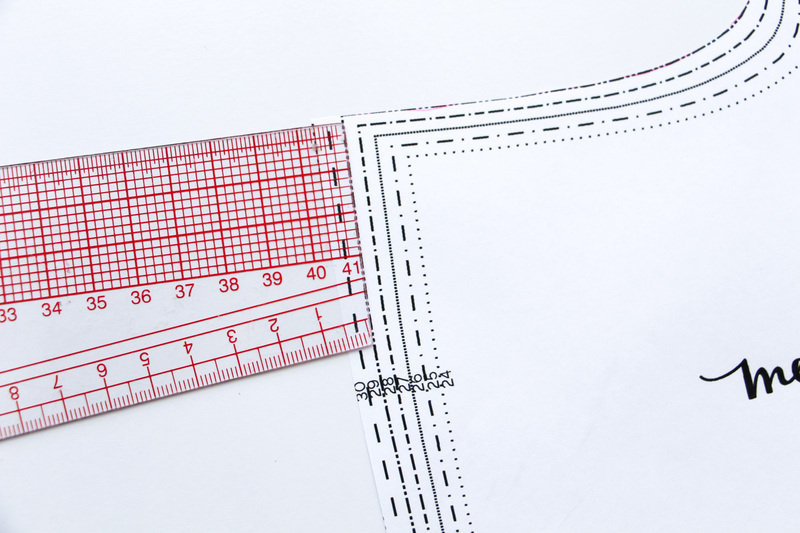 When choosing your size (in any sewing pattern) it is really important to choose your size based on your actual body measurements, not your perception or expectation of your size based on the size labels, or even based on the finished garment measurements. Always go back to your body measurements. For the Ash jeans specifically, I have chosen a sizing convention based on waist measurements to mimic many ready to wear denim brands. If you find that your body measurements put you in a size that is different than you expect, please don’t be upset, it’s just a number, and at the end of the day you are the only one who knows the number and the most important thing is that you make jeans that fit well and are comfortable. 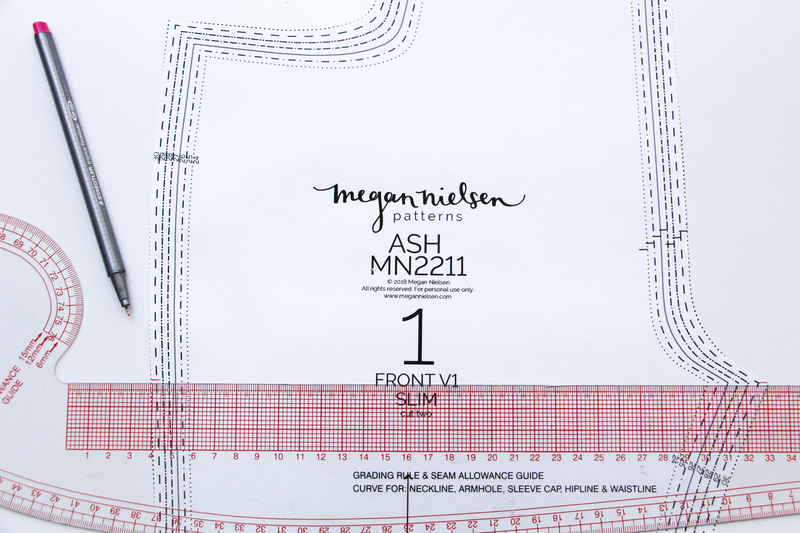 You’ll notice in this pattern that the finished garment measurements include negative ease. 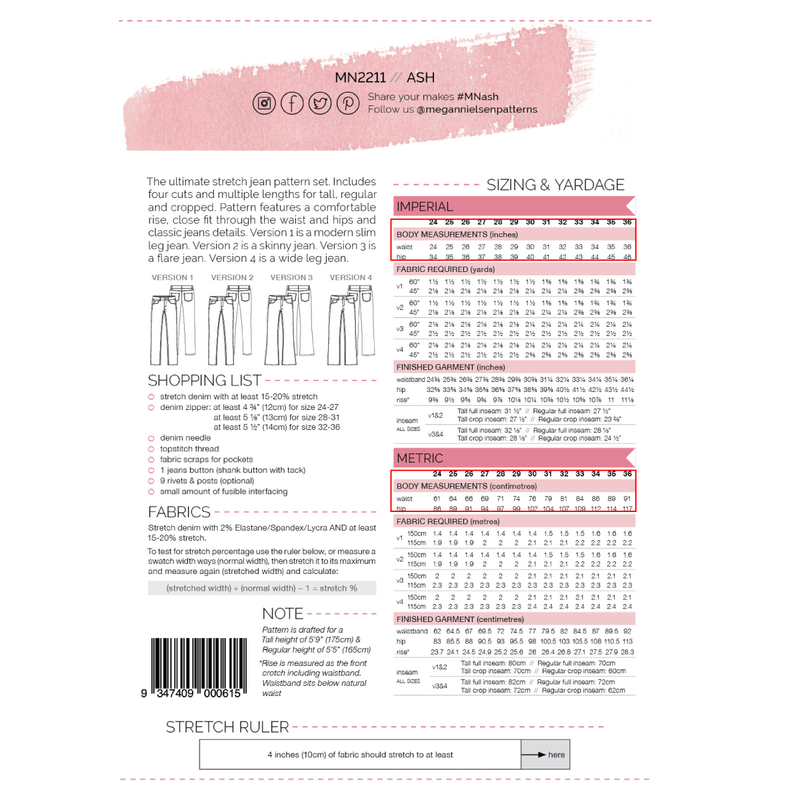 This is because this pattern is designed for a stretch fabric and as such the finished garment measurements will be smaller than your body measurements. If you happen to buy a fabric that includes less stretch than the pattern requires, don’t stress out. 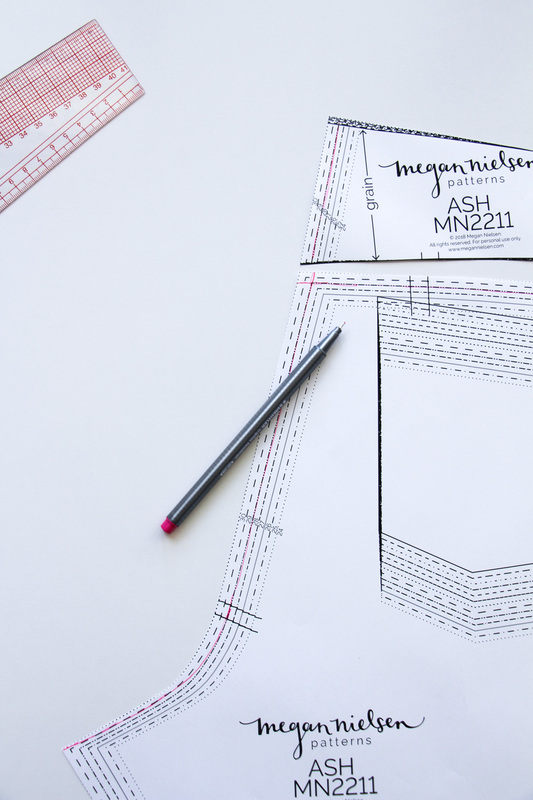 You can still make this pattern with a less stretchy denim – you will just need to size up! If you’re very lucky you may find that your body measurements land you in one straight size. But for most of us, you will likely find that your waist and the widest part of your lower half (your “hip”) fall into two different sizes. To get the best fit possible you should thoughtfully blend between these sizes, so lets have a look at how to do that! First up you’ll need to gather the pattern pieces that require adjustment. You’ll need the waistband, front, back, pocket bag, pocket facing and yoke. 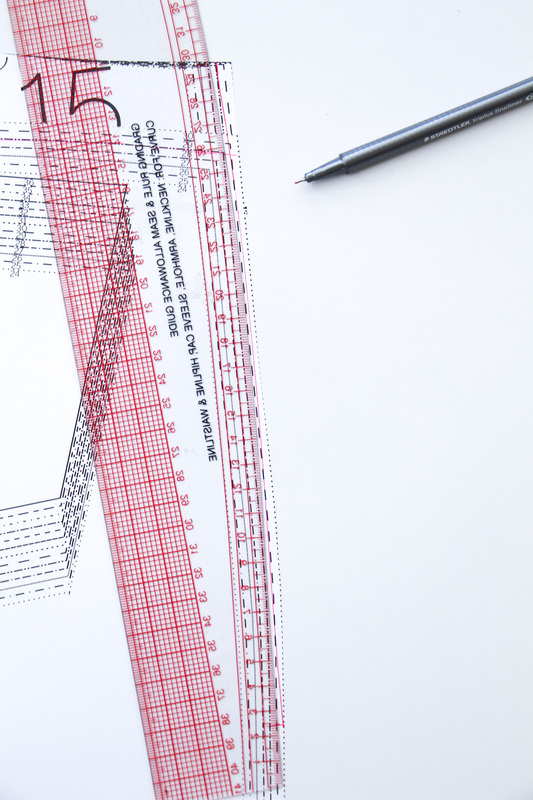 You will also need a hip curve ruler, a pen or highlighter and scissors. If you don’t have a hip curve ruler please don’t panic, you can just eyeball it. No one will die. Cut your waistband in the size that your waist measurement corresponds to. Using myself a the example again, I measure a size 28 in the waist. 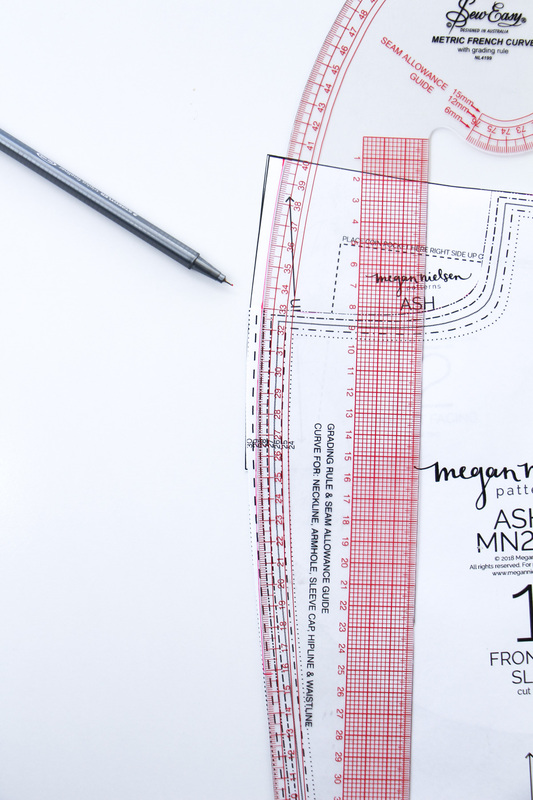 For the front pattern piece, cut out the size that corresponds to your hip measurement or the larger size. For me that is a size 30. On the front pattern piece mark the point where your lower body is the widest. 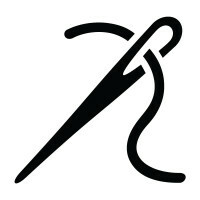 As you know, we call this the “hip” in sewing, and for me is my upper thigh around about the bottom of the crotch seam. Using your pen draw in the pocket opening and waistline edge for the size that corresponds to your waist measurement (for me this is a size 28). For the crotch curve, follow the waistline size down the crotch curve until you hit the notch. 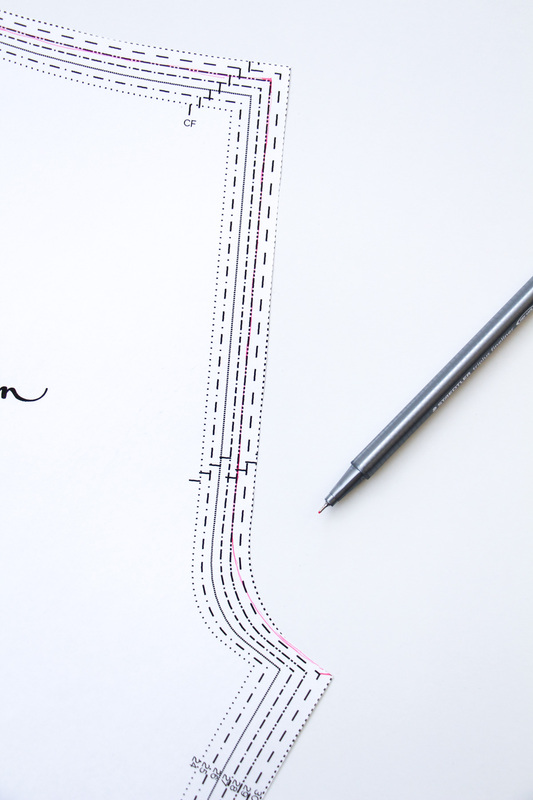 When you reach the notch draw a curved line from the notch until the mark you placed before. 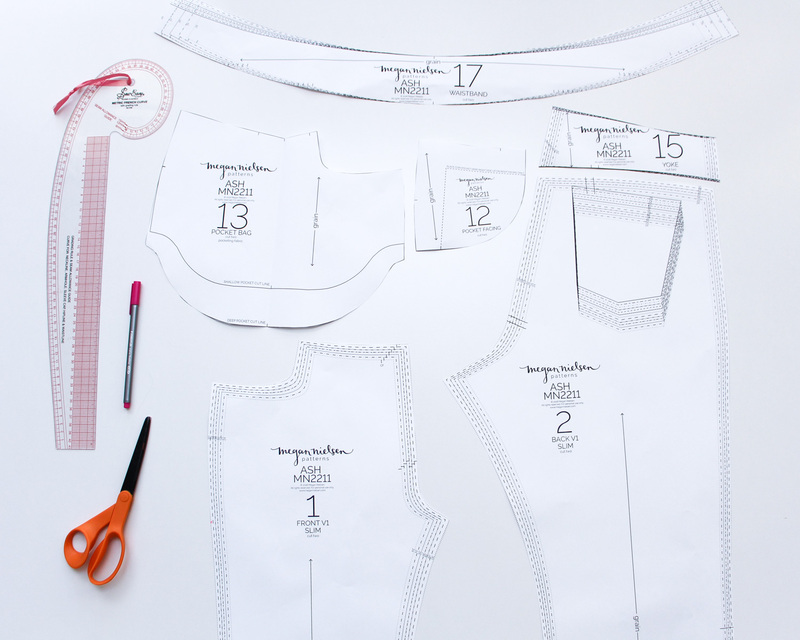 Cut away along your lines and you’ve adjusted the waistline and the crotch curve. Lets move onto the side seam. 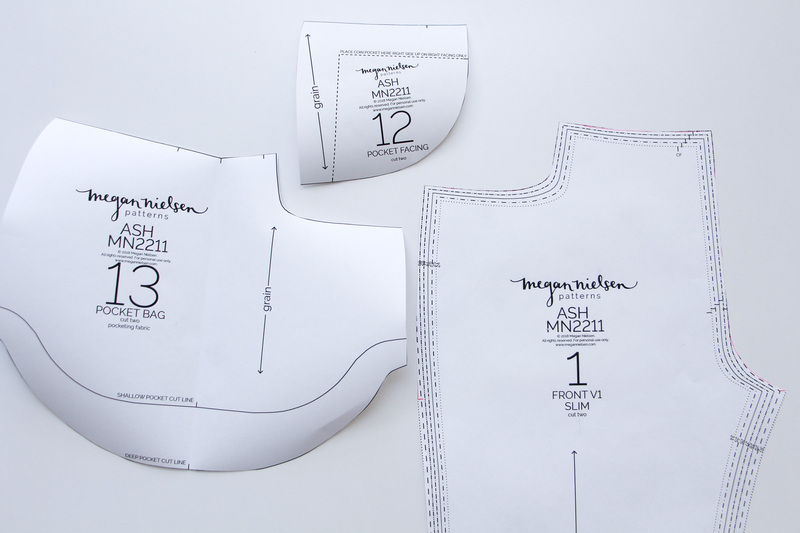 At the side seam measure the distance between the hip size and the waist size. For my example, there was a 6mm difference between my hip size (30) and my waist size (28). Fold the pocket bag in half and then place the pocket facing on top in the correct position. Place both the pocket bag and pocket facing under the pocket opening in the correct position. 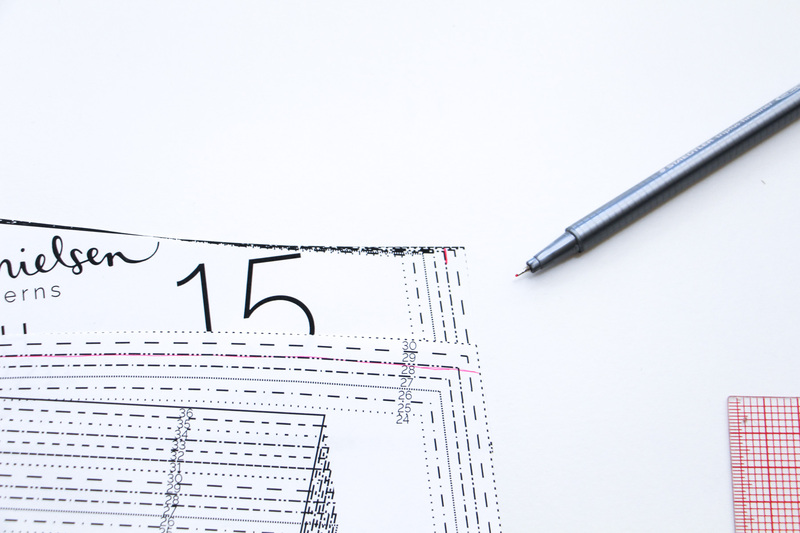 At the waistline measure the difference between your hip and waist sizes and mark it with your pen. 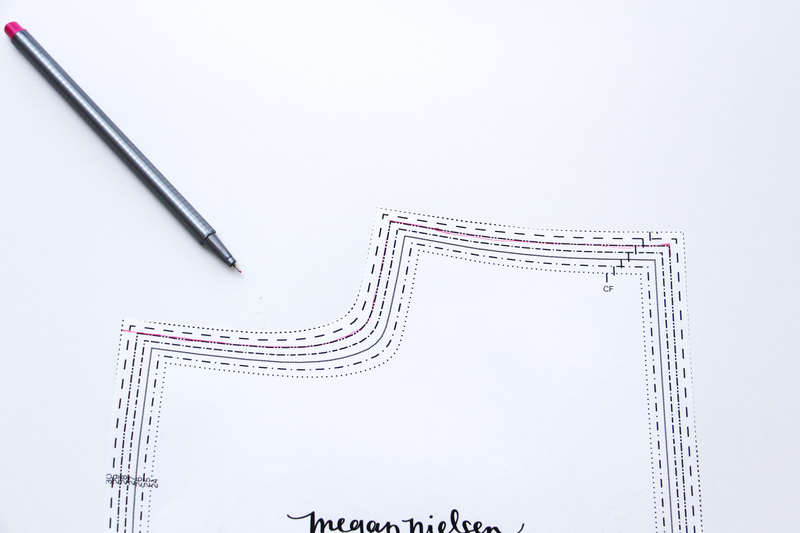 Using a hip curve ruler draw a curved line from the waistline mark to the hip side seam mark. 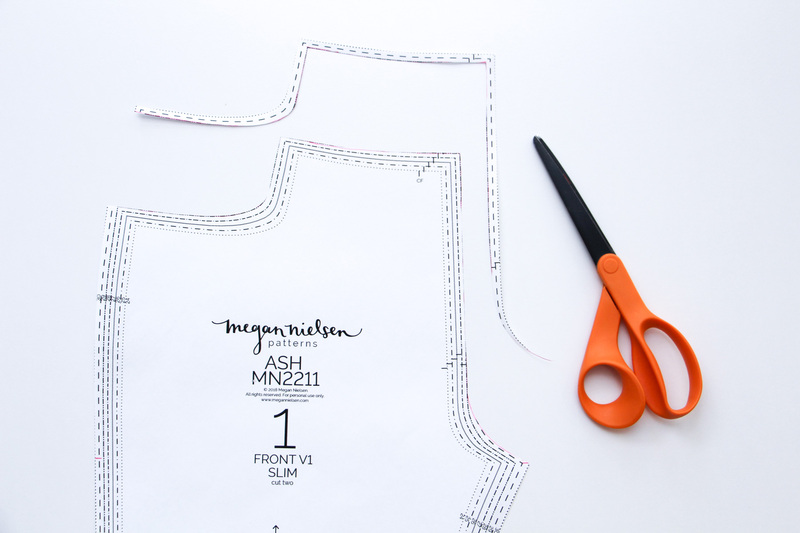 This is your new side seam! 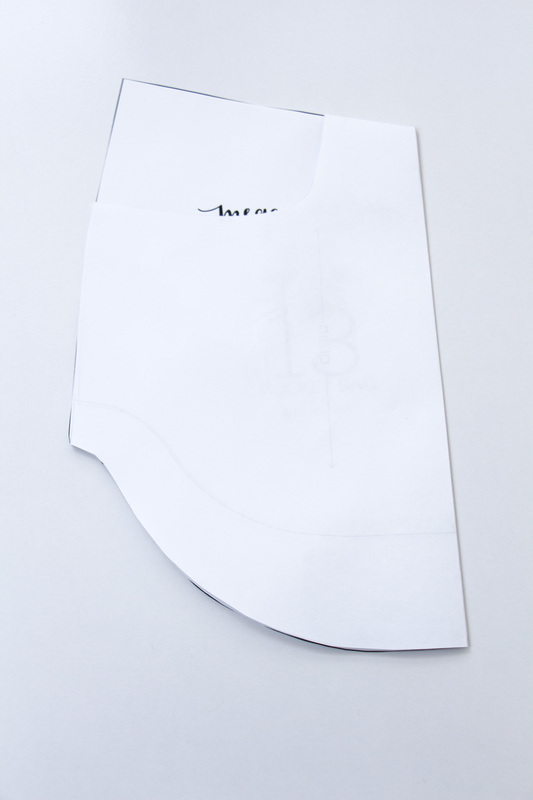 Cut away the excess paper on the front, pocket bag and pocket facing. and you now have your fully graded front pieces. Lets move onto the back pieces. 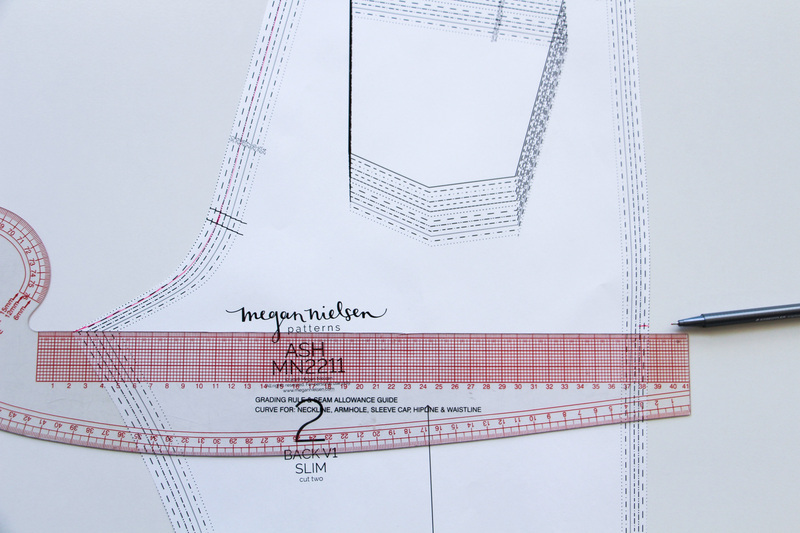 As with the front pattern piece cut out the size that corresponds with your hip measurement, or the larger size. Mark on the back pattern piece the point where your lower body is the widest – ie your “hip”. For me this was inline with the crotch. At the top of the back pattern piece mark the waistline size along the yoke seam. 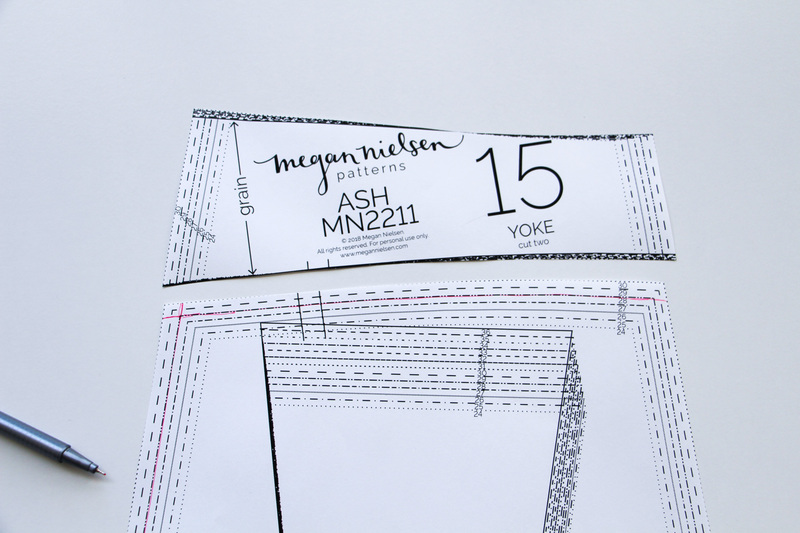 For the inner yoke seam mark the waistline size. For the back crotch, mark along the waistline size until you reach the notch. Once you reach the notch, draw as smooth a curve as you can to meet the hip mark. For the side seam, overlap the yoke and back pattern pieces by 3cm so that they sit where they will be once sewn with seam allowance. Remember the measurement we made between the hip size and the waist size? At the waistline on the yoke pattern piece, mark in from the side seam by that amount. 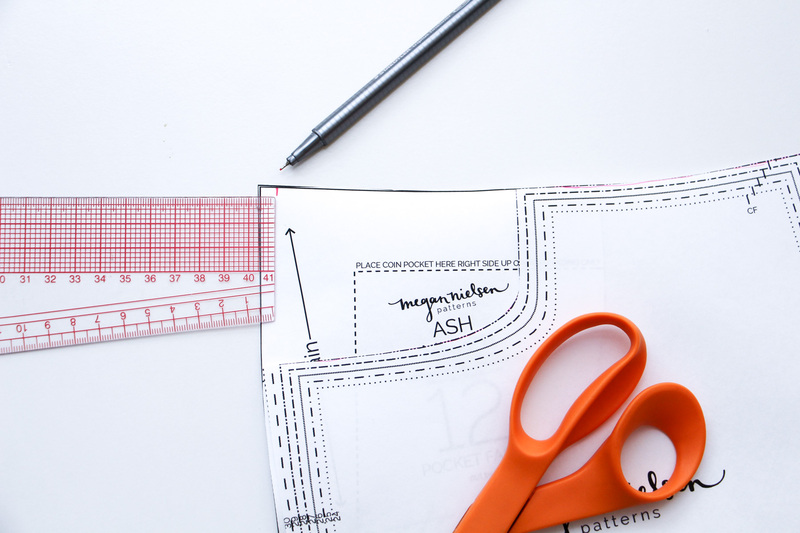 Using your hip curve ruler once more draw a new side seam from the hip mark to the waistline mark on both the back pattern piece and the yoke. 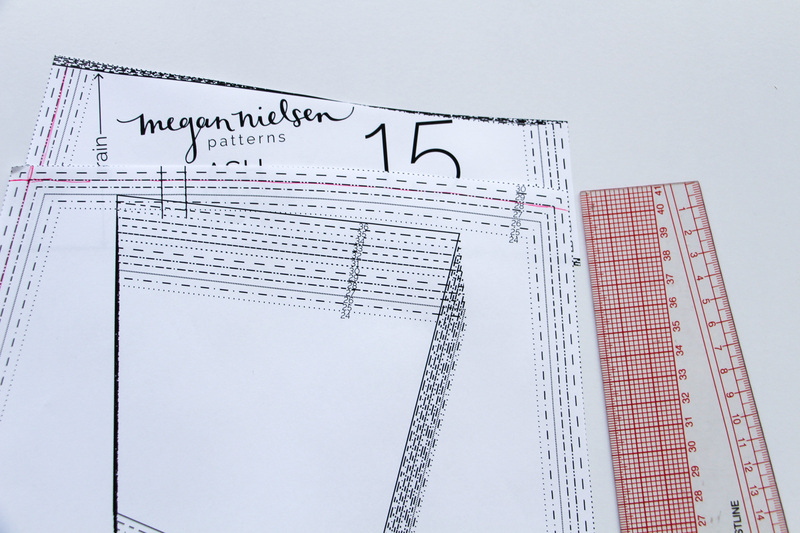 Trim away the excess and you now have your amended pattern pieces! I hope you found this useful! If you have any questions please let me know in the comments! This is really helpful, but I still have a question. Am I correct in assuming that if my waist is 28.5, I should size up to a 29? 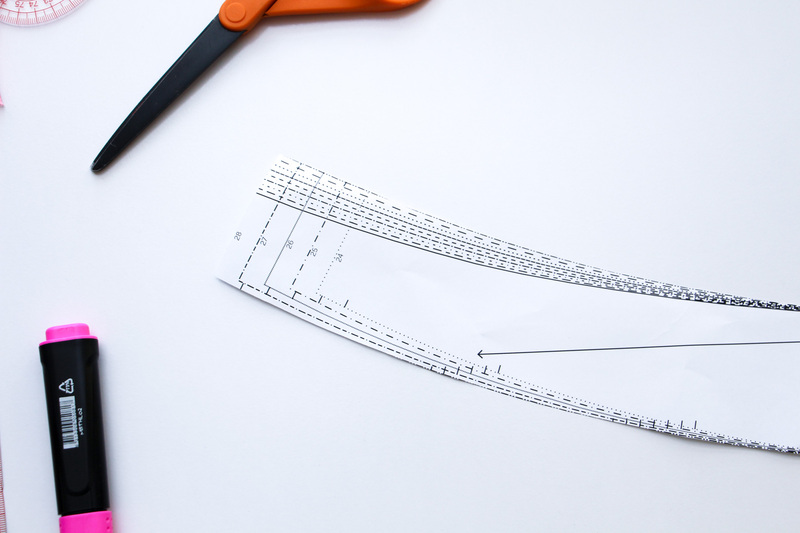 I’m a pretty straight figure… so how would I do it if it’s backwards to these measurements? my hip is a 36 and my waist is closer to a 29. Just pick the size that coordinates with my hips (sz 26) and grade out to the waist (sz 29)… or the other way around? So, how would I grade if I am a size 16 in the waist and a 12 in the hips? Many thanks from an apple shaped person ? ?